There are currently four Correctional Centres in Vanuatu. 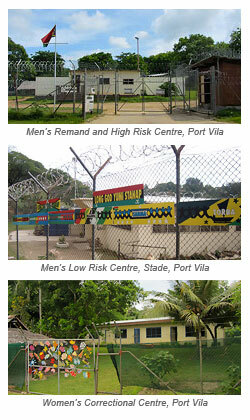 In Port Vila there are three Centres dealing with higher security and remand detainees, low risk detainees and females. The Luganville Correctional Centre caters for all types of detainees. The Department of Correctional Services is planning to upgrade the Luganville Correctional Centre, with construction due to start in late 2015. This project will provide important benefits to the Luganville community and to the northern provinces. Correctional Centres provide a range of rehabilitation activities to support detainees to live a good life when they return to the community. Low risk detainees are also involved in providing services to the community and the government via work programmes. These programmes include cleaning and maintenance, agriculture and construction.